Wilson Elementary School was nearly buried last week after a series of winter storms dumped several feet of snow around the valley. 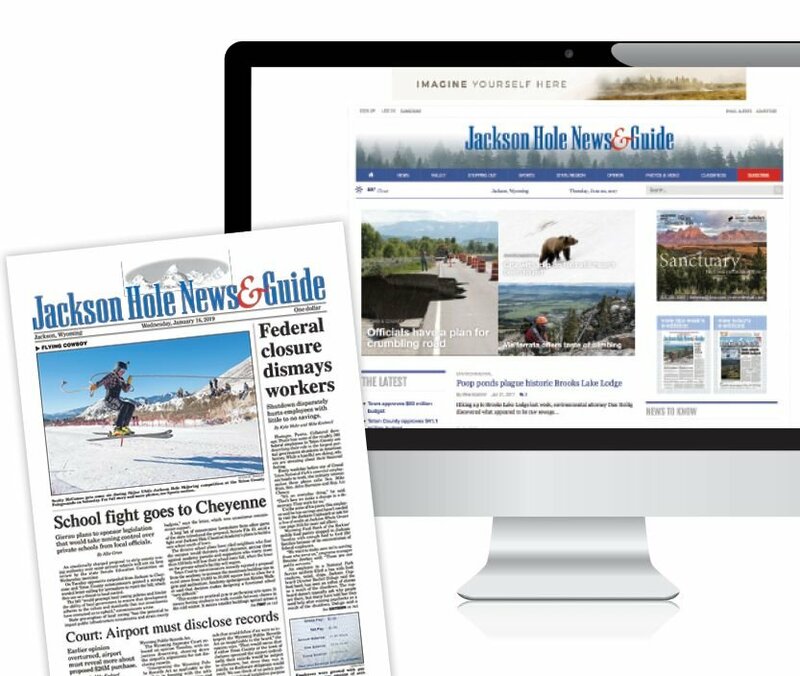 With less sun and colder temperatures, structures in Wilson held more snow than other locations around Jackson Hole. A man blows snow off a driveway Thursday on Flat Creek Drive. Residents around the valley spent the week digging out from the snowiest February on record. Snow droops off a roof on Thursday. Dusty Lawson chips away at ice on the roof above his patio on Thursday. This latest snowfall marks the second time this month Lawson has shoveled his roof. A snowman melts on Thursday. Cars plow through deep puddles on Broadway Avenue on Thursday. Stock haulers drive into the void Thursday afternoon along Highway 26/89/191 in Grand Teton National Park. The highway was closed between Moose and Moran from Sunday until Thursday due to heavy drifting snow. Dozens of bison rest and graze open grasses Thursday afternoon near Kelly Warm Springs in Grand Teton National Park. A coyote guards a piece of vertebrae from hungry magpies Thursday afternoon in Grand Teton National Park. Snow slides from a barn roof Thursday on the Mead Ranch as temperatures crept above freezing. Cloudy skies linger over Grand Teton National Park as the latest storm to hit Jackson Hole begins to dissipate Thursday afternoon. A heavy load at the weigh station west of Teton Pass. Goaltending along Fish Creek Road. Teigen Moore of Mountain X Excavation plows snow from the parking lot up an ever-growing mountain at the Teton County Fairgrounds last week. 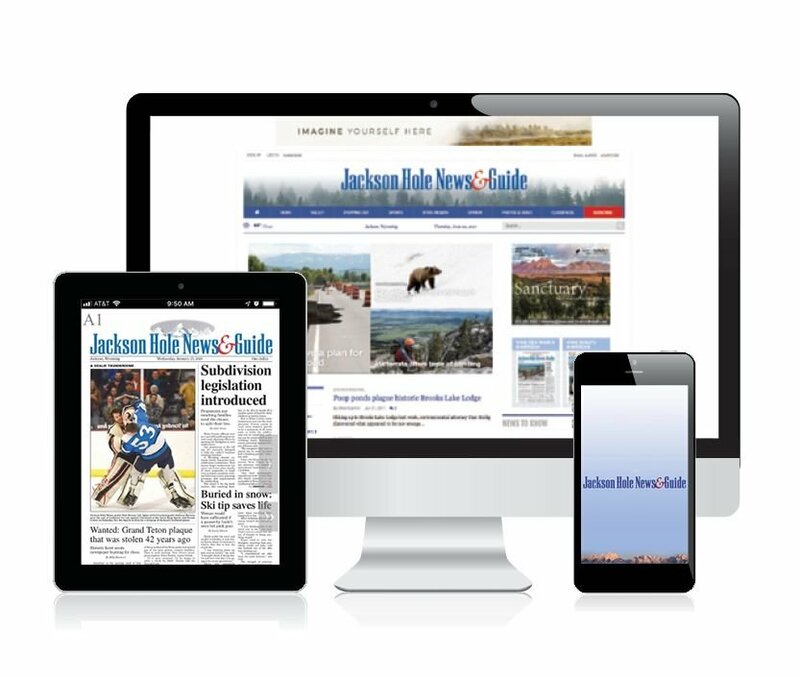 See this week’s Jackson Hole News&Guide for a photo essay on February’s serious snowfall. A tree towers above the barren winter landscape along Spring Gulch Road on Thursday. 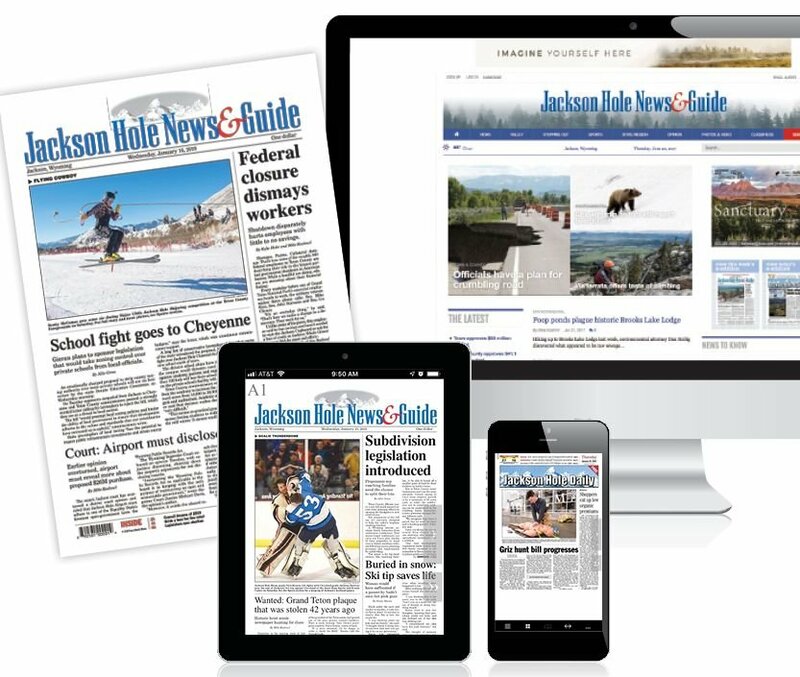 February 2019 was a historic month in Jackson Hole. Town proper handily beat 1978 for snowiest February on record, with over 50 inches compared with the old, unimpressive record of 33 inches. February also made a hard run at January 1969 for the title of snowiest month, period, when there was 56 inches, but fell short by a mere 3.1 inches, largely because of warm weather that arrived a week ago. Regardless of the numbers the month was one that will be remembered — accumulation made it hard for both two-legged and four-legged residents to travel the blanketed valley. Wilson held onto the snowfall particularly well, as has the Teton County Fairgrounds, the home base for trucks brimming with snow looking for a place to unload. Other parts of the Hole have already started melting, and streets are starting to shine through. But the year isn’t over. At this Wilson house you almost feel the joy of finally making it home. Sun sets on Sleeping Indian after a storm begins to clear. Icy art forms on Sue Muncaster’s garage door window on a subzero morning in February. A red fox chills outside the home of Vance Carruth. Whitney Oppenhuizen took this photo of a friend skiing back from Leigh Lake in Grand Teton National Park, with drifts nearly covering the signs along the road. While our staff photographers shot all sides of February's storms, we also wanted to see this historic month from your perspective. We asked readers to share their shots, some that showed deep curves in deep powder, a peek into how our resident wildlife have been faring and frosty mornings along the Snake River. Thank you for sharing your view and taking us behind your lens.